Register by 1 September by e-mailing Merrilyn Groom at m.groom@unsw.edu.au with your details. Why are people loyal? How do groups form and how do they create incentives for their members to abide by group norms? Why do companies have mission statements? Why do people pray? What gives rise to patriotism? To democracy? Think economists don’t have the answers? Think again! Come join us co-authors Paul Frijters and Gigi Foster for discussion of these issues and more, led by Professor Andrew Clark. For all alumni, the YCL may arrange an exclusive lunch event with the authors on Tuesday, 10 September. If interested, please e-mail editor@yale.org.uk by Monday, 26 August. 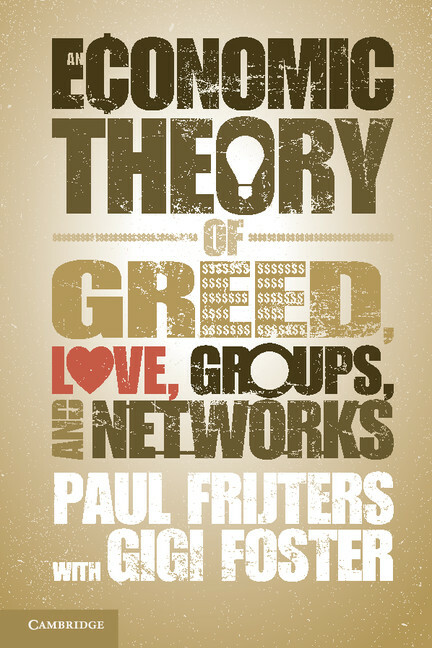 Professor Paul Frijters is a professor of economics at the University of Queensland. He was elected 'Best Economist under 40 in Australia' by the Economic Society of Australia for 2009–2011, and his work consistently ranks in the top 4% of downloaded and cited economic research in the world. Professor Frijters has undertaken research in a wide variety of fields, including happiness and well-being, migration in China, behavioural economics and health economics. For more information on Professor Frijters go to http://paulfrijters.com/. To register, please send an e-mail with your details (name and number of guests) to Merrilyn Groom (m.groom@unsw.edu.au) by Sunday, 1 September 2013.